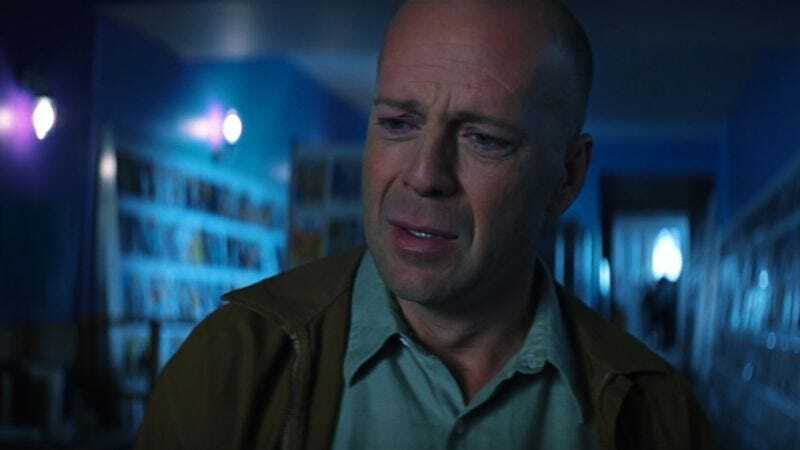 Bored with boring fireballs, Bruce Willis has begun talks about reteaming with M. Night Shyamalan, whose avoiding of anything so dull as an action-filled climax in Unbreakable is the only kind of thing that can keep Willis awake these days. Deadline reports that the increasingly maligned director, and the actor who’s made it clear he doesn’t need this, are interested in making the aptly named Labor Of Love, a movie about Bruce Willis walking. In it, Willis would play a bookstore owner who loses his wife in an accident, then starts to see dead people’s emotional needs: “Haunted by the notion that he never properly told his wife how much he loved her,” Willis sets out to prove it by walking across the country for her, something she’d once asked him to do—presumably, purely hypothetically. It’s an early screenplay Shyamalan sold way back in 1993, before he’d become synonymous with the word “twist,” and as such it’s a slightly different story than one might expect. Either that, or maybe the twist is that Willis discovers the "country" he’s walking across is just one giant fireball, causing him to die of boredom and be reunited with his wife.